It is my pleasure to introduce you to Lyndsey. She’s stopping by today to share a fall SWAP (Sewing With A Plan) project that she recently completed. Thanks so much for being here Lyndsey! Hello! I’m Lyndsey Stanfill on Instagram as @madelouisville. I’ve been sewing with Oliver + S patterns since my sons were born. 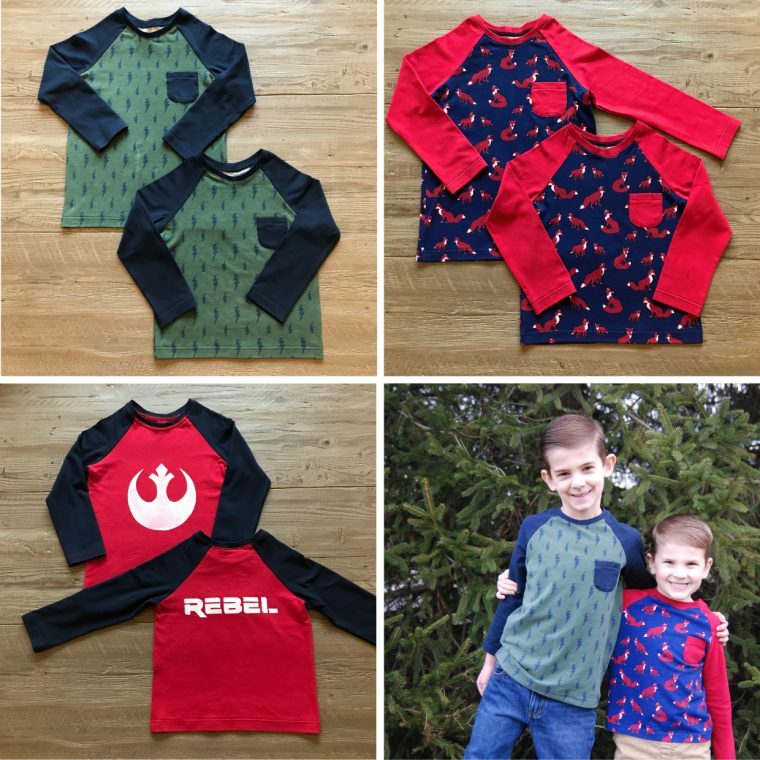 I love that I can use these patterns to sew an entire wardrobe for my boys, and that I can get so many different looks just by changing the fabric choice. With a demanding job and two small children, I find that I have to be very focused to fit in time for sewing. I usually plan my sewing projects several months ahead, choosing the patterns and fabric for all the pieces before I start sewing. In the lingo of the online sewing community, we call this a SWAP which stands for Sewing With A Plan. The purpose of a SWAP is to be more thoughtful about what you sew and be less prone to impulse sewing. That way every sewn piece is worn several times and you avoid a closet full of “nothing to wear.” Often SWAPs are designed with an emphasis on coordination of garments so that all the pieces work together to maximize your investment in time and materials. This summer I decided that instead of buying a back-to-school wardrobe for my children, I would sew a fall capsule using the SWAP approach. I started the process by laying out all of their fall clothes to take stock of what I already had, what I wanted to sew, and what I would choose to buy. 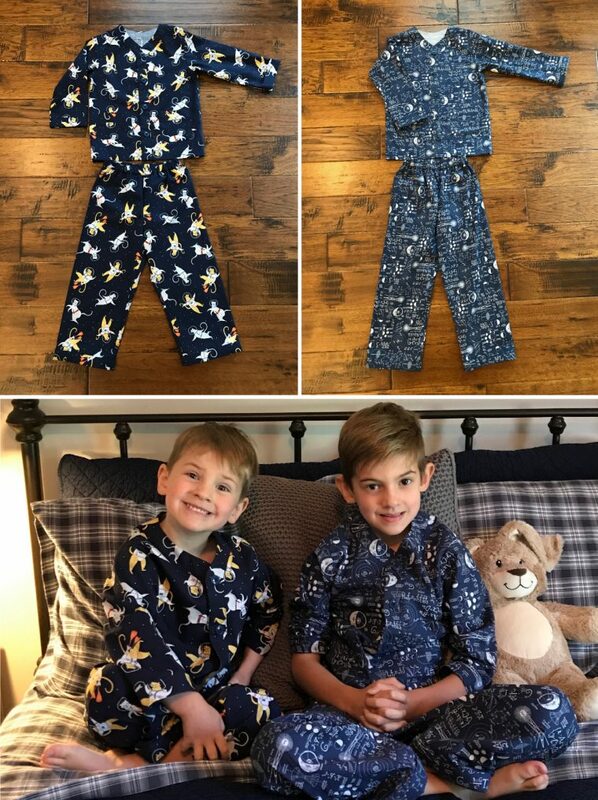 The boys needed cold weather sleepwear ASAP, so the first week of August I started the SWAP with Sleepover Pajamas. I have to admit I was afraid these woven pajamas wouldn’t get worn very much since my boys had only ever slept in knits. Turns out I had no reason to worry! The boys didn’t balk in the least, and the Sleepover Pajamas quickly became their favorites. Both boys already had plenty of long pants from hand me downs and off-season purchases but very few long-sleeved shirts. I like to sew the same pattern multiple times, so for the SWAP I decided on one woven pattern and one knit pattern that I would make up several times in different fabric for variety. 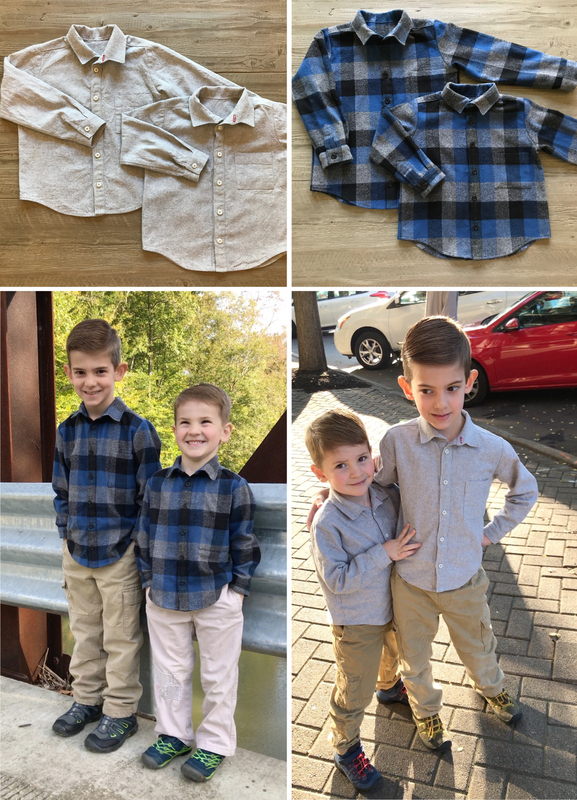 For the woven pattern, I sewed two Sketchbook Shirts for each boy. The first shirt was sewn in a shot linen, and the second shirt was sewn in a cotton flannel. Both versions are great for layering, and the linen shirts can be worn into the warmer months as well. For the knit pattern, I used the Field Trip Raglan T-Shirt. When I was planning the SWAP, I decided on two versions of the T-shirt, each with a print and a coordinating solid. 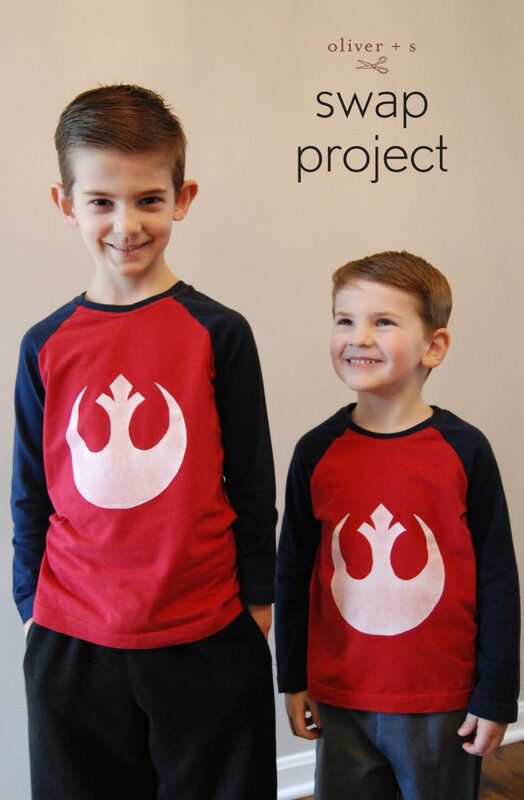 I was pretty sure that I would have enough fabric leftover for a third T-shirt for each boy. Since the third T-shirts would be sewn with leftover fabric, I wanted to try something new. I used a silk screen printing kit to print on the front piece and back piece before sewing the T-shirts. 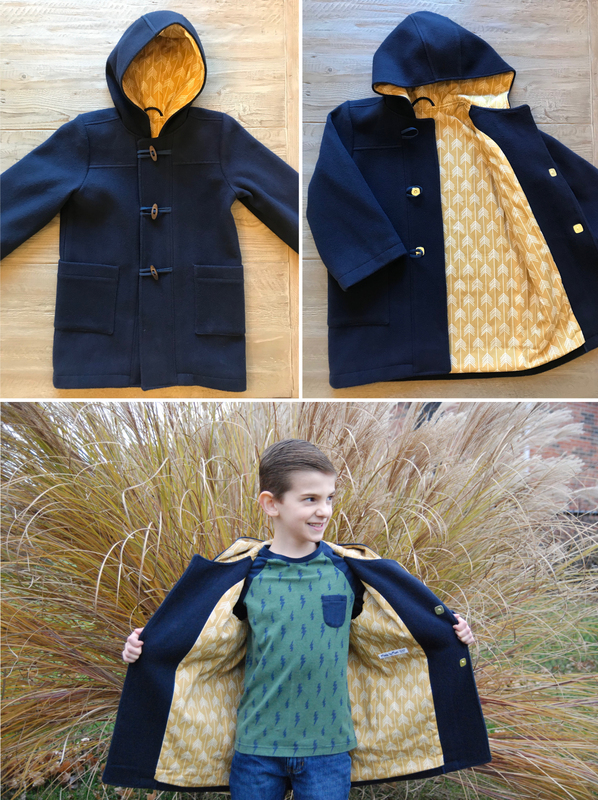 The last piece on the SWAP was a new School Days Coat for my older son. I have used this pattern to sew a coat every other year for the last five years. (My younger son now fits into the first coat I made for his brother!) Since I have sewn this pattern several times, I knew that I could sew it quickly, but it had to be finished before the cold weather set in. Putting the coat at the end of the SWAP kept me very focused! I was finished with all 13 pieces on the SWAP by the end of November. Since I spent time doing all the planning on the front end, I always had the next project ready to go. This really helped me make progress with my busy schedule. Now the boys have a unique wardrobe filled will clothing they wear again and again! That is so awesome Lyndsey! You are so talented. Love the pictures! Wonderful ! The boys are darling too! Love them all ! Lovely makes, and such a great idea to plan them all to work together and fill wardrobe gaps – and getting multiple uses from your patterns, as well. Good work! This is incredible for me!! I’m always sewing behind schedule… I really admire you, Lyndsey! Handsome boys, beautiful pictures. Congratulations! This was so inspiring.The boys looked really cute in their sleeping suits.Loved the coat!! Wow! I don’t know what impresses me most: your organization, your diligence, or those beautiful garments. All of the above, I’d say. That’s amazing! The boys are adorable,…I mean so handsome! When my grandsons were born I despaired of being able to sew for them as they got bigger, but you have given me hope and inspiration. Love everything about this Lyndsey – very inspirational! Amazing work! I know how hard it is to balance children, home, and work. You make it all work with ease! Your projects are beautiful. And my great nephews are very handsome! Lovely work! Perhaps your example of a thoughtfully made wardrobe will encourage one or both of them to learn to sew in the future. You do great work and the boys look so fashionable. You are clearly an accomplished and creative person. Well done for completing all these projects. It’s never easy when you are also looking after children as well! Where did you find boiled wool?